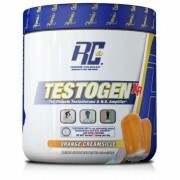 Ronnie Coleman Signature Series, The Ultimate Testosterone & N.O. Amplifier World’s 1st Concentrated Testosterone & Nitric Oxide Booster One Month Supply! Only 1 Scoop Needed! Optimize Testosterone Levels Maximize Nitric Oxide Production SensaCool Flavor Technology..